Ray Zak has been with J&B Medical Supply Co Inc since 2006 and with HNC Virtual Solutions since 2008 handling Compliance and Contracting for both companies. His health care background goes back to the 1970’s when he was a Nuclear Medicine Technician and implemented a Nuclear Medicine program in a major Hospital in Grosse Point Michigan. In 1985 he partnered with a fellow student and started a Nuclear Pharmacy providing radioisotopes to most Nuclear Medicine departments located in the Tri County area of Michigan. Moving into the Health Plan world in 1988, he accomplished the implementation of a Medicaid Clinic Plan in the State of Michigan, and was also the Regional Director of a Hospital Physician Organization in Michigan. Telemedicine became apparent in the medical community because of the shortage of physician’s in various communities and in the needs of health care in general. 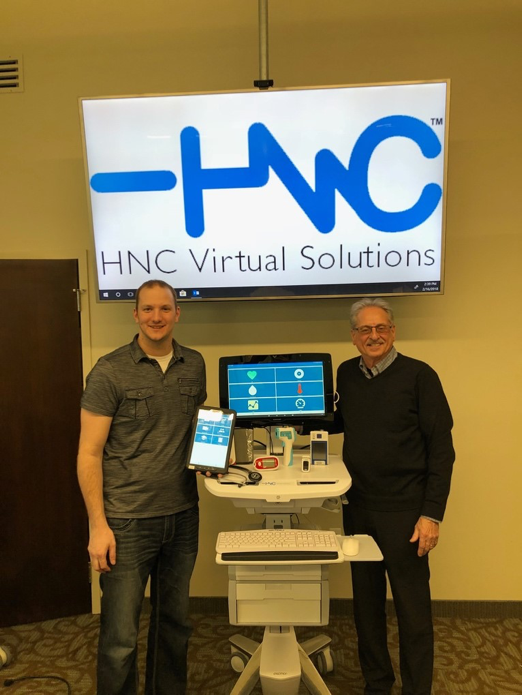 HNC Virtual Solutions became the next step in moving medical care forward with a technology that is currently being used in the USA and will continue to grow all over the world. Craig Novosat is an IT Project Specialist who has been with HNC Virtual Solutions since 2014. Craig develops IT solutions for existing and upcoming deployments, maintains existing Telemedicine IT infrastructure, helps shape and design the patient experience with our platforms, and acts as liaison between our departments for solutions engineering as well as to our customers to enact requested changes. Craig has worked closely with multiple hospital systems and health care organizations utilizing his several years of medical-related IT experience. Becoming part of HNC Virtual Solutions was a clear choice because Telemedicine is such an explosive market. HNC Virtual Solutions Telemedicine and Telemedical platforms range from basic face-to- face consultations to more detailed examinations using FDA-certified, wireless diagnostic devices. Telemedicine is considered to be one of the most innovative tools available to the medical community in recent years. It benefits both the patient and physician in its ability to have a patient connect with a physician anywhere in the world virtually. HNC’s solution uses wireless remote diagnostic peripherals such as: pulse ox, blood pressure, glucometer, ECG, stethoscope, spirometer, ultrasound, microscopic camera for dermatology, E.N.T. viewing, and also a medication monitoring system. These peripherals are FDA-approved and integrated with HNC’s FDA-Certified software. The ability to monitor vitals remotely is an invaluable resource to immediate medical care. The ability to consult face-to-face in real time and monitor a patient’s vitals remotely greatly increases the patient’s care by bringing the physician to the patent anytime, anywhere, and any place. Medical Travel Today (MTT): Tell us how you got involved with international telehealth and telemedicine. Ray Zak(RZ): J&B Medical Supply Co Inc. was formed in 1996 and is a nationally women certified business enterprise based in Wixom, MI. Mary Shaya and Dr. Fawzi Shaya are the owners. J&B is a national provider of consumable medical supplies with exclusive/preferred contracts with many major health plans and with several states. As J & B continually expanded and had success in all facets of its business, Dr. Shaya came to the conclusion that telemedicine was the future of care delivery and invested significant time and resources. Dr. Shaya’s vision was simple and compelling: provide access to health care anywhere, any time, and any place. The entire J & B family believes strongly that access to health care is a right and not a privilege. In 2008, he formed Health Net Connect, Inc. which is now HNC Virtual Solutions. Patients are becoming consumers leveraging technology and are demanding access and convenience. A person may use their computer or smart phone to perform a face-to-face consultation with a physician about their medical issue. The doctor can virtually see you, ask questions, and obtain some type of answer to the concerning health-related issue from that encounter. In addition, this physician consultation could result in advising the person to have other types of diagnostic exams or, from the consultation and diagnostic content, provide a treatment program that could determine a prescription be administered should the physician have enough information to deem one necessary. Craig Novosat (CN): The idea is that if the consumer can use a thermometer, blood pressure cuff, or glucometer or a bevy of many other devices to provide information to health care professionals from anywhere to the world to make some clinical recommendations. RZ: HNC Virtual Solutions also has the capability to provide peripheral devices for diagnostic testing. A person may have a face-to-face virtual encounter and be examined with the diagnostic peripherals. HNC has in their own proprietary telemedicine solution. All peripherals are FDA Class II certified and integrated into our telehealth platform. Some of our devices include a pulse oximeter, weight scale, glucometer, spirometer, ECG, and a stethoscope to name a few. These peripherals make it possible to get diagnostic testing completed and documented electronically. The recent medical results as well as a person’s medical history can be retrieved by a physician or specialist when illness or injury strikes. Hotels, cruise ships, and yachts could use this system as an added benefit for their travelers, especially visiting countries without readily accessible medical care. MTT: Right. And so where is your technology specifically being used physically? In the US or outside of the US? RZ: Both. In the US, we are in major hospital systems such as St John Providence Hospital in Southfield, Michigan for cardiac monitoring, and Paulding Hospital in Paulding, Ohio to name a few. In Paulding, they remotely examine correctional inmates to eliminate the need for an inmate to be transported to the hospital if at all possible. Abroad, we are also in Pakistan offering healthcare to over 1.5 million people through 55 centers with our Kiosk Solution to people who have never had access to care. Also, in the Ghana deployment, we are offering healthcare to those without access to specialists. CN: Yes, in addition to the deployments previously mentioned, North Memorial in Minnesota is doing a tele-stroke program and Hurley Hospital in the northern part of Michigan has maternal/fetal monitoring. We also have the University of Michigan for their deployment of their left ventricular assist device (“LVAD”) patients waiting for heart transplants or who have already had a heart transplant. They can be monitored from afar. MTT: What is the cost of acquiring the technology? CN: We have a flat rate for our software depending on which version of our software you use i.e. Kiosk/Consumer Model or Remote Patient monitoring. We also offer leasing programs and which peripherals are needed affect the costs. Definitely making the software affordable is our priority. RZ: The peripherals of all these instruments and diagnostic tools are FDA Class II certified. We bring them into our facility and then integrate them with our FDA-registered software. MTT: Walk us through the process of how it all works. You provide it to the hospitals, they distribute the technology and peripherals to the patient? RZ: There are various scenarios depending upon where a unit and peripherals are deployed. For example, with our consumer model a white labeled consumer application can be downloaded by a patient and given a code, input their insurance, or charged a fee to schedule and do a clinical visit with an available clinician. The kiosk system is equipped with a PTZ 360-degree view camera which can be used for telestroke, telepsych, or maternal fetal medicine. These kioks can be placed in Federally Qualified Health Centers or even urgent cares for physicians outside of the facility to be able to remote it and provide a real time physical examination. MTT: Are there other channels for this? RZ: Really, anywhere that care is needed. In Pakistan, they’ve got our units up in the mountains. Because of the satellite connections and ability to generate power via solar panels, it can be used anywhere. MTT: Are you distributing in South America? RZ: We are not currently in South America but we have some units in Mexico, Ghana, Pakistan, and Kurdistan and are currently working on expanding out our offerings around the world with our continued success in showing providing healthcare to those in need who otherwise would not have access. RZ: Physicians are looking to provide care in various countries around the world. We show how HNC can be used to monitor patients by residents in Peru, for example, while the examinations and results are monitored by physicians in the USA. This is an educational tool and, obviously, patients are getting treatment they could never have perceived. MTT: Right. And I was going to say, senior citizen developments and anywhere people are at risk. RZ: Our mission is to be able to provide healthcare anywhere, anytime and anyplace. Being able to offer a real time clinical intervention in healthcare is what drives HNC. MTT: I see an application in palliative care, visiting patients nearing end-of-life. This could be an easy way to monitor them. You have an interesting story to tell. RZ: This is unique because the nurses, medical assistants, and other ancillary medical-certified or licensed professionals come out of school and this is being discussed in a big way. I’ve been talking with local community colleges who may actually put together a seminar or training programs in which students may now earn a certificate in telemedicine. This is where it opens the door to giving these professionals more knowledge about telemedicine.